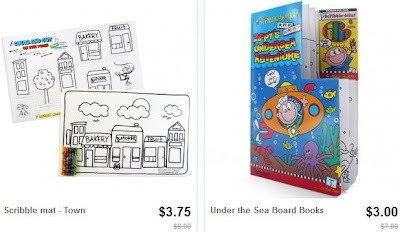 Reusable Scribble Mats only $3 + Possible Free Shipping! Right now at Totsy, you can get Scribble Mats for as low as $3.00. There is a very large selection of products to choose from, including mats, puzzles, and books. These are great to bring on road trips, doctor appointments and going out to eat. Kids "scribble" on them and they can easily be wiped clean for endless hours of reusable fun!